Late night patrols had become an every night thing with Ben and Bloom. Their Prefect roles meant working together to make sure students were in their common rooms rather than out in the hallways causing trouble. On top of being partners, they were dating as well. This made the entire thing much more fun for the young Prefects. Walking the hallways together made Ben happier than anything else. It put him in a good mood if they did catch students, so it was a win-win for everyone. "Where do you want to start tonight?" he asked, his tone calm without a hint of worry. "Owlery might be good since we're right here." The halls were quiet so far. The Ravenclaw Commons were not exactly in a hot activity zone. Most action they might catch here were students leaving the owlery too late or trying to send a late night message. Their patrol to the seventh floor and beyond would be where they normally would catch a student sneaking around. Not that they often caught anyone at all. That would finally change tonight not that they knew it. Ben stopped and squinted down the hall. He tilted his head at Bloom wondering if she heard it too. Someone seemed to be nearby. A Ravenclaw late to the commons? Something else? A booger-eating creature? They had to find out. Ben still held Bloom's hand but his other went for the wand so they could light up the darkened corridors and stairway. "Lumos!" he whispered to activate the beam of light coming from his wand. "Did you hear that?" It seemed to be coming from the stairway nearby but he wasn't sure. He was not all about punishing students but he wanted to keep his job so he took it seriously. Whoever was down there, they would find them! Ben only hoped it wasn't a ghost or some creature. He didn't want to risk being afraid in front of Bloom. The night was dark and the wind was cold. Walking down the halls with Ben, Bloom felt as though her future looked bright and she was warm. Holding his hand while walking down she looked at Ben, in awe that she was with someone that she truly did like, a lot. She smiled. "If we go to the owlery now, we're going to spell like owl poop for the rest of the night," she slightly joked. Bloom was not much of a fan of the owlery, however, and it was not just because it was the most awkward situation for her with Reid. It was primarily because she hardly got any letters from her parents after she would send them long letters about her time at Hogwarts. But she knew that it was a part of her rounds with Ben and she needed to keep with her responsibility. Bloom was about to mention about one of her classes when her ears perked at the sound of footsteps. When the footsteps got closer, Bloom unhooked her hand from his and took a couple steps away from Ben. The last thing she needed was to have other students see that they use their patrolling time as a way to keep their relationship running or professors to think that they were not responsible enough. Holding her wand out, she halted on calling out a spell. Ben had already lit up the room with his wand, she wanted to be sure to defend or attack if need to be. Who knew what would be coming towards them. Her heart pounded at the thought. Could it be a creature? What about a bad person? Who knew. She began to walk slowly towards the staircase. Wondering what could be causing the noise. Time zones were not a friend to Galim. She was used to the Israeli time zone that was two hours ahead. While it may not be too extreme, over the past few days, the hours have been adding up, making Galim nap at various hours and forcing her to stay up in the night. Granted, she had nothing to look forward to in terms of teaching. All students were first years and were not permitted to take her class until they were a third year. Now was her time to get acquainted with the castle and other professors. As of now, it was time to get acquainted with the Scottish night. Galim enjoyed spending her time in the corridors as the stained glass windows were remarkable in the moonlight. It reminded her so much of home in Sefad. The colored stain glass was what filled most of the windows around town. It was a small town in Israel that was not only spiritual, but artistic in its own way. Many artists around the world make their way to Sefad and most stay for good. Taking in the cold air of the corridor, Galim made her way to the second floor corridor from the third floor. Walking down the stairs, she saw a flicker of light coming from around the corner. Students up this late?, she asked herself, wondering how students would be up past eleven o'clock. She did not want to be doing her duties, but if they were students that were not permitted, then she had to do what was done. Galim walked down the stairs and turned the corner to see two students, one with their wand shining a light and the other holding on to the other tightly. Galim took her wand and nudged it against the boy's wand to lower the light. She looked at both students and saw that they were Prefects, perhaps doing their rounds in the corridor. "It's a bit late for you two to be doing your rounds, she called them out. It was getting closer to midnight, and prefects were only allowed to do their rounds until eleven. She walked past them and urged them to follow her by looking back with her eyebrows drawn up. "Why are you two still up? she asked, not caring in the least bit. She just wanted her corridor free for her own enjoyment. But now that these two were breaking rules, she had a duty to follow. And one thing she learned in the IDF, was to take your job seriously, even if you don't feel up to it. Ben's eyebrows raised slightly at the comments from the Professor. He had never really seen or spoken to her, but he knew of her at least. When she pushed his wand down he frowned and simply kept it lit while pointed at the ground. Part of him was glad Bloom decided to step away, part of him felt a piece of himself ripped away as she did so. This professor did not seem the type to approve of them being together and being Prefects together. Perhaps a bullet dodged there. "Just getting finished here," he muttered, not sure if that was really true until now. "No offense, but which teacher are you again? I don't have your class." His brain was searching hard for an answer but he was coming up blank so far. Not that it mattered much yet, but he didn't want to make an important teacher mad, or any teacher mad really. Bloom and he almost always were up later than usual because they tended to purposely be a bit slow. More time together was always great. It was no date but it at least meant he could see her alone. Being alone with anyone at Hogwarts was apparently a struggle. Paintings, teachers, students, ghosts, and whatever else all worked together to make sure Ben never got to actually spend quality time with Bloom alone. Where is she leading us? Ben thought to himself as he glanced to Bloom for answers. He began to follow Professor Galim as indicated but did so slowly. He was wary of if they were in trouble or not. Had she seen them locking arms? Did a painting blab about them? Ben started to rush scenarios through his head as he tagged along. Although a part from Ben, she felt as though she needed to hold his hand during the mysterious reveal of who may be around the corner of the corridor. Relieved, she saw that it was only a professor, however, it was a professor who she had never seen before. Was she knew? Did she just arrive? She had no idea. One thing Bloom did know for sure was that her and Ben were caught. They were up past their patrolling hours, and who knows how much she heard as she was coming down the stairs. She could have heard them talk about the Owlery. It then hit Bloom, was it too late to do patrols? They had just started and this professor, who obviously came from a different country, had thought it was later. Was she mixing up times from wherever she was from and now? "Professor, I don't mean any disrespect, but it's not late at all. We are just starting our rounds," she said, playing with her fingers, worried that maybe she did come off a bit too voiced. As a result, she was asked, along with Ben, to walk with her. Where are we going? she thought to herself and Bloom's brown eyes looked at Ben in worry, seeing from his facial expressions that he had the same question, too. Were they in trouble? Are they going to detention for no reason at all? Again, who was this teacher? Luckily, Ben had asked the question. Now they were both to know what professor was standing before them. Fear. It was an emotion she fed off of. In line with fear comes mysterious, and later respect. Connecting with children was not her forte. Maya was connected to culture, to music and to the Muggle world. Teaching children was not her go-to career. It just so happened that the school that she once belonged to was in need of a cultural Muggle Studies professor. She was inclined to help the school as it had helped her when she was younger. Walking down the corridor, silent, the male Prefect asked who she was. She smirked at the thought that she was invisible to a lot of students. In a way, she quite enjoyed that. She would rather be in the shadows than out in the light. Perhaps it was the reason why she always wore her scarlet robe. I teach Muggle Studies and run the rehearsal room," she answered, keeping her slow pace down the corridor, passing armored statue by armored statue. "You will not be taking my class until your third year here," she added, giving him the answers that he was looking for. Maya had no idea where she wanted to take them. She felt as though she needed to keep a watch on them, though. There was something about the two. They weren't just co-workers, they were a bit more. She thought of it naive if they were in a relationship. At their age, it was fake. It was just them figuring out their emotions and connecting with each other. Maya found it comical if they were an item. Stopping in her tracks, she turned around and looked at the girl, her head raised high. "And where would you have gone to, Ms. Silverton?" she said, her voice stern. 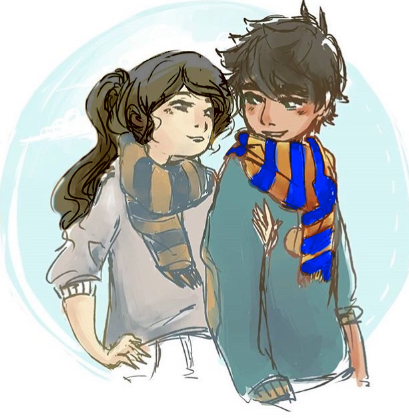 Her eyebrows raised in question, verbally cornering the Ravenclaw girl. Maya knew of their plans as she heard it while going down the stairs. The Owlery was a private place with only one entry. It was easy to snog and leave without getting caught. She knew of this very well from her young years at Hogwarts.